Santorini Holiday Transfers is the data controller of your data. Your personal information is safe with us. Links to third party sites appear on the Site. Those third party sites are not our responsibility, although we choose them with care. You should read and satisfy yourself with those third parties’ privacy policies before using such linked sites. We will only collect personal information about you and given by you when you register with us. We will always let you have a copy of all personal information we have about you should you request it. Contact info@www.santoriniholidaytransfers.com to do this. where you supply information to us in order that we deliver a required service, information will be processed by us to supply the information and material which we promise. 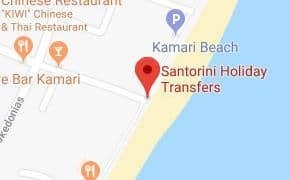 Your information is held at Santorini Holiday Transfers. We will not pass on any information provided by you to any third parties. Santorini Holiday Transfers will take precautions to protect against the loss, misuse and alteration of your user data under our control. Only authorised employees and subcontractors will be given access to the information you provide us. Our systems are designed to ensure that your data can only be viewed online. While we cannot guarantee that loss, misuse or alteration to data will not occur, we take many precautions aimed at preventing such occurrences.